Israeli soldiers abducted, on Sunday at dawn, two young Palestinian men during extensive and violent searches of homes in Qalqilia governorate, in the northern part of the occupied West Bank. 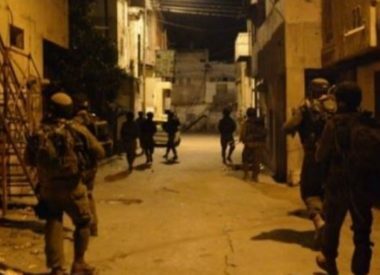 The Qalqilia office of the Palestinian Prisoners’ Society (PPS) said the soldiers stormed and ransacked many homes, and interrogated several Palestinians before abducting two. It identified the abducted Palestinians as Ahmad Mustafa Nour, 19, from Anabta town, east of Tulkarem, and Anas Mazen Abu Aisha, 18, from Shweika area, north of the city. The soldiers invaded and searched many homes in Shweika, interrogated many families, and searched several surrounding lands and hills. Owners of some of the invaded homes have been identified as Waleed Suleiman Abu Sheikha, Sa’id Sarhan, Ahmad Sarhan and Mazen Abu Aisha. Furthermore, the soldiers searched homes and stores in Bal’a town, east of Tulkarem, and confiscated surveillance equipment. Also at dawn, the soldiers abducted three young men, including a former political prisoner, in Qalqilia governorate, in northern West Bank, and summoned for interrogation three others, including two children, from Bethlehem governorate.